I know that in America, many places will install smoke detectors, such as home, school and some poker club. So, it is ordinary seeing smoke detectors in these places. After testing, we produced the smoke detector IR camera for cards tricks use. How does the smoke detector work? Wireless transmitter issued a wireless alarm signal, notifying the remote receiving host, and pass out the alarm information. 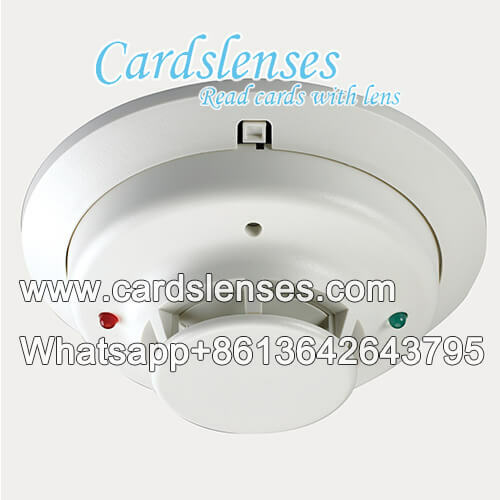 The working principle of the infrared marked cards camera is similar to the smoke detector. Wireless transmitter will send the image from the IR camera to the signal receiver and you can see all the marked playing cards on a monitor. The monitor can be a computer, and a smart phone. Like other IR juiced cards camera, this smoke detector ultimate marked deck camera has its working distance range. Normally, its working distance is within 100 meters. But we can offer you the particular reading system. And to be honest, the more particular of the distance you can us, the clearer camera we can make for you. So, you have better measure the distance between IR camera and you poker table. The IR camera is installed into the smoke detector, but it won't affect the operation it. So, just enjoy your game.